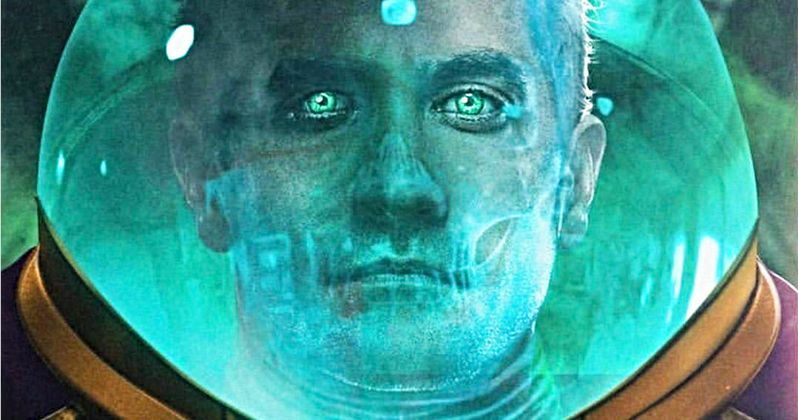 Jake Gyllenhaal as Mysterio Revealed in Spider-Man: Far from Home Set Photos? Jake Gyllenhaal has allegedly been spotted on the set of Spider-Man: Far from Home in his Mysterio suit. Speculation of Gyllenhaal's involvement has been swirling for months since it was never confirmed by the studio nor the actor that he was going to be in the sequel, but we now have proof, thanks to some leaked photos and video from the set. Spider-Man: Far From Home has been filming around England and different parts of Europe, including Prague and Italy all summer into the present. The leaked set video from Spider-Man: Far From Home is taken from pretty far away, but some freeze frame images provide proof that it's Jake Gyllenhaall. The suit colors can be seen and they show off a green suit along with a purple cape and gold gloves. The fishbowl helmet is not seen in the video or the images, which means that it could be used in other scenes. Gyllenhaal is also sporting a beard in the leaked material, which was filmed in Liberec, Czech Republic. Jake Gyllenhaal had been spotted around the London set of Spider-Man: Far From Home a few times over the summer, which led to even more speculation that he was starring in the sequel alongside Tom Holland. It looks like Marvel is staying pretty close to the source material for Mysterio's suit and it looks pretty awesome from the leaked images. The fishbowl helmet may or not may be used in the sequel, or it could be added in digitally in the post-production process. For now, we'll just have to wait and see. Spider-Man: Far From Home hits theaters next July, after Captain Marvel and Avengers 4. With that being said, it's kind of weird that there has been a pretty significant amount of material from the movie that has leaked online, providing the best look at the Spider-Man movie than the other two projects that come out well ahead of the Spider-Man film. It's believed that production on Spider-Man: Far From Home is preparing to wrap and head into the post-production process. It should be pretty comforting to Marvel fans that we finally have confirmation that Jake Gyllenhaal is playing Mysterio in Spider-Man: Far From Home. While Marvel Studios is generally pretty slick about keeping all of their secrets under wraps, the Spider-Man sequel seems to be an exception to that rule, which is mainly because the film appears to have so many outdoor shots in pretty busy areas around Europe. And while we have a pretty decent amount of leaked images from the set, the specific storyline has yet to be revealed at this point in time, which means that there's still plenty of more surprises on the way, like explaining how Peter Parker was able to come back from the conclusion of Infinity War. You can head over to Marvel for some more information on the sequel. For now, you can check out the latest leaked images from the Spider-Man: Far From Home set featuring Jake Gyllenhaal below.